Are we Lying when we’re Witnessing? Taravu dives into the water as he desperately tries to elude his pursuers. He shutters with fear as he thinks of the fate that awaits him if he is captured. His body is weak with exhaustion and his lungs burn with every breath. Taravu reaches the other side of the pond and scrambles through a briar patch. His body is numb and he barely feels the thorns ripping into his flesh. Ten minutes earlier, while on a hunting trip, he ran into the hunting party of a distant village. Although the two tribes have never been friendly, they have never been enemies. However, all of this had changed recently. The different tribes in the area were now kidnapping their neighbors for a special purpose. 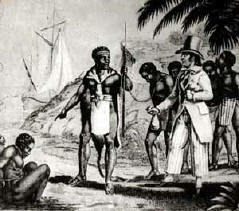 Some men with ivory skin were now buying these prisoners and taking them to a distant land to be used as slaves. The practice of slavery was not new in this region. Whenever one tribe conquered another tribe, they would keep some of the survivors as their own slaves. Yet, now they are being paid handsomely to capture more slaves and sell them to the slave traders. Slave trade was big business in this part of Africa, and it was no longer safe to wander alone too far from your village. Fortunately, Taravu escaped this fate, but millions of natives were not so fortunate. A tragic thing about the despicable practice of slavery is the fact it was done by a country whose founding principles made no provision for slavery. The Declaration of Independence says, "All men are created equal." It didn’t say all white men were created equal, but all men were created equal. Our country’s practice was diametrically opposed to its own governing rules. It doesn’t matter if some people felt they could justify the morality of slavery; it still contradicted their country’s founding doctrines. As hypocritical as this sounds, many Christians do the same thing. A large number of Selective Salvationists practice something completely different from what they believe in theory. This is especially true in the way they witness. Think about what we tell people when we are witnessing to them. We tell them God loves them and wants them to spend eternity with Him. We tell them Jesus died for their sins and if they accept His pardon, all of their sins will be forgiven. If selective salvation is true, however, you would be lying if you give this message to someone who is not one of the chosen. If you truly believe in selective salvation, you are obligated to change the message you use for witnessing. God is not glorified or honored when we deliberately lie while we are witnessing. Many Selective Salvationists are reluctant to talk about this doctrine when they are witnessing. There are a couple of reasons for this reluctance. First, they are afraid the person they are witnessing to would be turned off and offended by such a harsh doctrine. Second, they are afraid the person will take a passive attitude toward salvation. For example, they may say, "Well, if I’m one of the elect, I’m going to get saved one way or another. If I’m not one of the elect, it doesn’t really matter. Therefore, there’s no reason for me to concern myself about it now. In fact, there’s nothing wrong with my complacent attitude. If I’m one of the elect, God will implant the correct attitude when the time comes. Besides, any attempt on my part to produce the proper attitude would be totally worthless." If selective salvation is true, it shouldn’t matter if people are "turned off" or decide to procrastinate. Those who are the elect will get saved in God’s timetable. An honest presentation of the gospel should not make any difference. Remember, even the best procrastinator can’t resist God’s calling. As you can see, if selective salvation is true, you must include it with the salvation message. To withhold this information is the same as lying. To withhold this information is the same as teaching a false gospel.